Posted March 31st, 2017 by Matt Colley & filed under Critical Illness, Family Income Benefit, Family Protection, Income Protection, Life Insurance, Moving Experience, News Round, Protection Insurance. 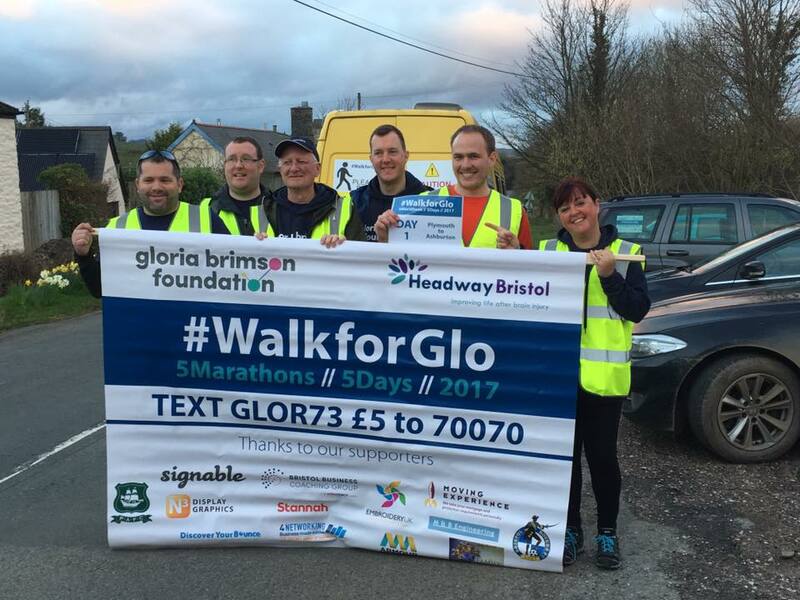 If you follow Moving Experience on Facebook you’ll have seen that we’ve been supporting Mark Brimson and his team recently, and their epic #WalkForGlo. A sponsored walk covering 5 marathon distances over 5 days! I’ve known Mark for about 5 years, and originally met him through business networking. I also know the majority of the walking team that agreed to take on the challenge with him, and I’m hugely proud of what my friends were able to achieve both collectively and personally. These are not elite athletes, and nor do they have a history of having attempted anything like this before, they are day to day people who agreed to push themselves in order to support their mate, and to raise money. When Marks first wife Gloria (known as Glo) died in 2007 his life turned upside down. He’s told me that he felt utterly lost, and that the subsequent 10 years have been hard whilst he’s attempted to come to terms with what happened, to grieve, and to manage these things whilst life carried on without his wife. The start point for Glo was diagnosis of an Arteriovenous malformation (AVM), which came to light while they were travelling in Australia. An AVM occurs when a tangle of blood vessels in the brain or on its surface bypasses normal brain tissue and directly diverts blood from the arteries to the veins. Brain AVMs occur in less than 1 percent of the general population, but sadly this was the case for Glo, who died after complications during surgery. On the 9th anniversary of her passing Mark made a declaration, which I witnessed, that the 10th year would be spent celebrating Glo’s life. He would take on a huge challenge, and lay down a positive memory for years to come. The aim is to spend a year fundraising for the Gloria Brimson Foundation, that he established, and a series of events have been planned. 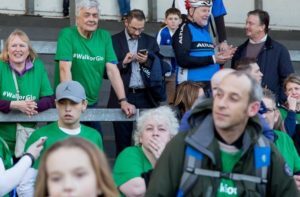 The #WalkForGlo team was made of a support crew, and walking team comprised of Olly Culverhouse, Nicky Marshall, Matthew Poole, Paul Simpson and Adrian Chase. They left Plymouth Argyle last Monday 20th March – remembering the first away game fixture Mark took Glo to watch. 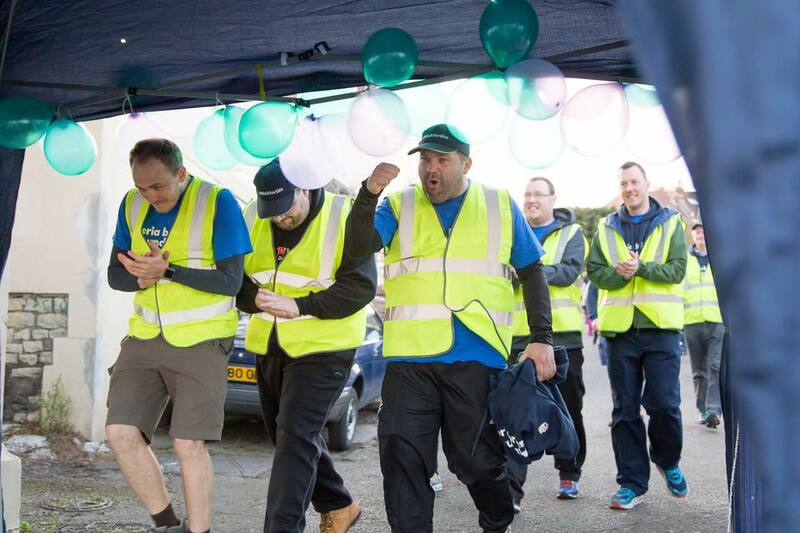 After 5 marathons in 5 days they arrived at Bristol Rovers’ Memorial Ground on Friday 24th – the team that Mark has supported since he was 4 years old. 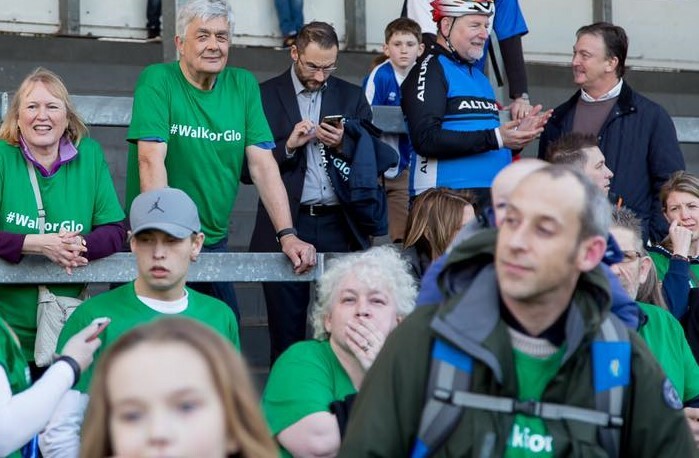 I am proud to say that, with my youngest son Harry on my back, along with other supporters I walked the final 2 miles with the team and was there to watch my friends cross the finishing line. The plan was to raise an initial target of £10,000 for Headway Bristol this year – the charity that would have supported Glo had she survived the operation. The good news I can report is that, with online and offline fundraising, they have smashed that amount already, which is fantastic! As I said in a Facebook post on Friday (24/3/17), I believe that the events of last week were inspirational. For Moving Experience to be associated with #WalkForGlo in some small way was an honour. Congratulations to Mark and all of the team.